Luxury waterfront living meets affordability here at Boca Towers, which offers some of the best values in Boca Raton waterfront real estate. Boca Towers consists of attached East and West 17-story buildings with a total of 272 luxury condominium units. 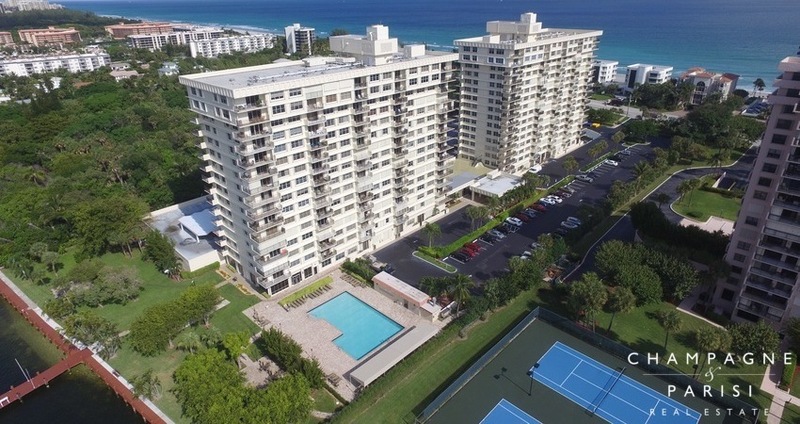 Perfectly situated between the Intracoastal Waterway and the beautiful Boca beachfront, condos for sale in Boca Towers feature breathtaking views of the Atlantic Ocean, Intracoastal, and Downtown Boca Raton. Boca Towers condominiums range in size from 700 to over 1,900 square feet of living space, offering one to three bedroom floor plans. Boca Towers was originally built in 1972, but recently underwent major renovations, with updates to the entire condominium complex. The project included new common areas, major upgrades to the fitness room, updated elevators, new plumbing systems, and added security. Security now includes secure gate access, doorman, security patrol, and a private guard. The monthly association fees at Boca Towers covers the cost of maintenance of the common areas, the exterior of the building, roof, and landscaping. The fee also covers basic cable, building insurance, pest control, pool service, trash removal, and water. In addition to being one of the most affordable waterfront condominiums in Boca Raton, Boca Towers is unique in that it is a pet-friendly condo community and also allows owners to lease their units with some basic guidelines. Many waterfront condos in Boca Raton do not permit leasing or pets, but Boca Towers allows owners to lease with some basic restrictions and permits residents to have one small pet up to twenty pounds in weight. Boca Towers is located on the east side of the Intracoastal Waterway on A1A, between Palmetto Park Road and Spanish River Blvd in the heart of East Boca Raton. This prime waterfront location is just steps to the beach, as well as some of Boca's gorgeous community nature parks including Gumbo Limbo Nature Center and Spanish River Park. Boca Towers is also convenient to some of the area's finest shopping, dining, and entertainment venues, as well as all of the excitement happening in downtown Boca Raton and Mizner Park, one of Boca Raton's most popular attractions. If Boca Towers sounds like the perfect place for your private South Florida Retreat, you may also want to visit nearby waterfront condominium communities such as San Remo Club and Sea Ranch Club of Boca, which also offer luxury waterfront condominiums with spectacular views in Boca Raton. If you would like to learn more about condos for sale in Boca Towers, or any of the surrounding waterfront condominiums in Boca Raton, FL, please contact Champagne & Parisi Real Estate at (561) 235-7800. You may also reach us by completing our simple online contact form provided below, and one of our expert agents will promptly be in touch to assist you. We at Champagne & Parisi Real Estate pride ourselves on providing the highest level of professional expertise and customer service and look forward to assisting you in finding your next dream condo in Boca Raton, FL.